In a world where it seems more people reach for their smart phones in lieu of their wristwatch to read the time, Alan Burrow is a rebel. At age 34, Alan, who lives in Jackson, MS, and works as a public servant of the state by day, not only still wears a wristwatch (he owns several, actually), he’s also a student of horology, the study of mechanical-timepiece repair and creation. Alan took on the challenge of learning timepiece repair six years ago when Brian Beckham, a certified gemologist, was opening a jewelry store in Forest, MS, and needed a watch and clock repairman. Alan did just that and began practicing on old pocket watches that people would bring to the store to scrap for gold and, before long, he was repairing family heirloom clocks and watches. 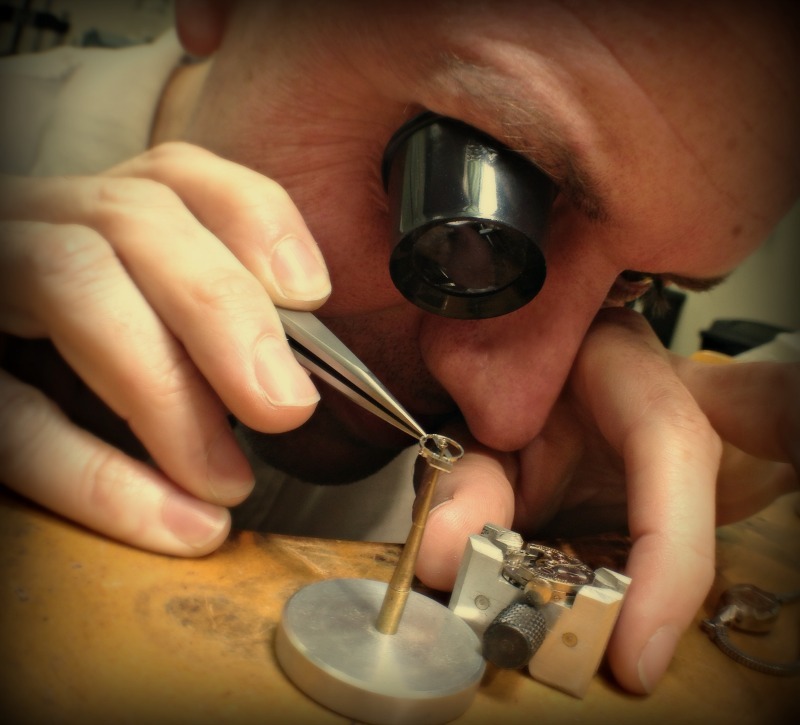 Wearing a loupe for easier viewing, Alan works with the most intricate tools and parts when repairing timepieces. And he seems to still enjoy it. His workbench is littered with an array of cogs and gears and springs and pieces so tiny that he needs special tools just to pick them up. Every situation and repair is different, and the work is nothing short of meticulous, requiring magnification and a dust-free environment. “Even a hair can mess up movement,” Alan says. But while he hammers and adjusts and squints and repairs, Alan becomes immersed in his work, be it fixing the mechanical movements or cleaning and oiling the inner workings of a timepiece—which requires full disassembly. Today, Alan and Brian co-own Beckham Custom Jewelry Co. in Jackson, MS, where Brian designs jewelry and Alan works on timepieces. Though the store has only been open a year, it’s been named the official jeweler of the 2014 Mistletoe Marketplace and will be designing a custom piece of jewelry for auction at the November event. Alan, who says he feels naked without a watch on his wrist, believes mechanical timepieces not only connect us to the past but can represent the finer things of modern life. Alan says mechanical watches began to lose popularity in the 1960s and 1970s when the quartz-movement watch hit the market. These disposable timepieces meant folks wouldn’t have to have their watches serviced every couple of years (as is required for proper operation of a mechanical timepiece). When the quartz timepiece quit working, the owner could get a new battery or just throw it out. Fortunately for those “old guys” and for Alan, consumer trends change as often as watch batteries need to be replaced, and the desire for mechanical watches has come back into fashion. Alan says that, because a watch is a “very personal item,” you should buy for yourself or, if you plan to purchase the watch as a gift, be sure you know the recipient very well before making the investment. Once you make the decision to buy a watch, consider the following to help ensure you’ve found the right timepiece for your needs. If the watch will be used daily, consider a metal band for durability. Leather bands are stylish but may be more appropriate for occasional wear. Don’t buy more watch than is needed. A daily-use mechanical watch needn’t cost an exorbitant amount. Compare costs before buying! Look for a Swiss-made movement to ensure the most accurate time-keeping and durability. Look for a “water-resistant” watch that will help fight against the ravages of humidity. “Water is a watch’s worst enemy,” Alan says. Consider personal style. Is the wearer…Flashy? Traditional? Sophisticated? Consider comfort, weight, and size. Some watches wind themselves as you wear them. Alan says this may be a feature for someone who prefers a lower-maintenance mechanical watch. Alan says that, while engraving adds to the sentimentality of the watch, it also devalues the timepiece for after-market value. So, consider whether the watch will be a keepsake or something short-lived.